Clockwise from top: Comparable to a 60-watt incandescent, this dimmable Sylvania Ultra A-Line 12W LED bulb casts focused light in one direction—perfect for recessed fixtures; this Philips Ambient LED A19 bulb uses 80 percent less energy than the 60-watt incandescent it was designed to replace and casts soft white light in all directions; this G.E. 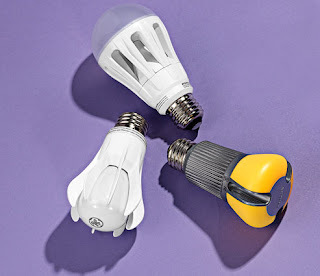 Energy Smart LED pronged bulb, the equivalent of a 40-watt incandescent, is among the few omnidirectional LED options. Photography by Cathy Crawford. "Come January newly enacted federal regulations for the sale of incandescent lighting will have homeowners across the country phasing out existing bulbs and weighing the numerous halogen, compact-fluorescent, and LED options on the shelves. The latter (shorthand for light-emitting diodes) are practically tailor-made for the kitchen, where food preparation and cooking require multiple sources of direct, concentrated light—precisely what this innovative technology provides. While basic LEDs cast their soft and (more often than not) cool-color glow in a single direction, making them ideal for undercabinet and recessed lighting, recent developments have yielded omnidirectional bulbs suited for chandeliers, sconces, and table lamps. They do come at a higher price than more conventional options, costing between $15 and $50 a pop. Still, with a lifetime of some 25,000 hours—roughly four times that of comparable compact fluorescents—and consuming just a fraction of the energy used by incandescents, they make for a sound investment. " Dominion Electric Supply stocks a lot of LED replacement lamps from Philips, as well as Bulbrite and Maxlite and others. We'd love to give you a dog & pony show to teach you all about them, so come on in and learn from our experts!